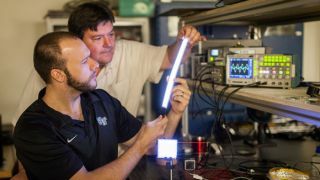 The limitations of compact fluorescent bulbs could light the way for new field-induced polymer electroluminescent (FIPEL) light bulbs being developed by Wake Forest University researchers. "People often complain that fluorescent lights bother their eyes, and the hum from the fluorescent tubes irritates anyone sitting at a desk underneath them," said David Carrol, a professor of physics at the U.S. college, in a statement. As the lead researcher developing FIPEL technology, Carroll hopes that the headaches and humming noises sometimes associated with CFLs can be a thing of the past. "The new lights we have created can cure both of those problems and more." FIPEL light bulbs are also unique because the bulbs are made of plastic, not glass. The Wake Forest researchers used an ano-engineered polymer matrix to convert a charge into light. The device is made of three layers of moldable white-emitting polymer blended with a small amount of nanomaterials. The result is a shatterproof material and a glow that creates a bright white light similar to sunlight, which the human eyes prefer. The human eye prefers the natural light of FIPEL light bulbs, while light bulb makers may take a liking to the easier-to-produce design compared to CFL bulbs. "One of the main drawbacks of CFLs is that they're very difficult to manufacture," Greg Smith, a PhD graduate student under Carroll, told TechRadar. "They're a very complex design; they use glass, they use mercury and they have a very complicated circuit that's inside the bulb itself." Plastic FIPEL bulbs are also said to be superior to OLEDs for the purposes of lighting up a room. "OLEDs are a very nice technology," said Smith. "But the tolerance required to build a large-area device for OLEDs is much, much higher than it is for our devices." FIPEL light bulbs are estimated to last anywhere from 20,000 to 50,000 hours, depending on brightness settings. This makes the bulbs ideal for offices, but Carroll and his team also see potential in large display lighting, from store marquees to signs on buses and subway cars. When these long-lasting bulbs do expire, they won't be a pain to throw away. "Although we don't anticipate that you'll need to throw them away in any short timeframe, they don't use any hazardous materials like CLFs, which have mercury in them," Smith explained. "These are all plastic, all organic polymers, so you don't have to worry about creating any kind of toxic or hazardous waste in your landfills." Wake Forest is already working with a company to start manufacturing FIPEL technology, which it estimates will be ready for consumers as early as next year...just enough time to convince your company to make the switch.